• Sign has white or black letters on a contrasting background. 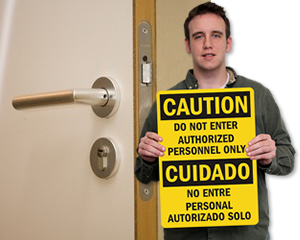 Sign is available in different colors (select the color in the next step). • Print is precision engraved onto acrylic, exposing the contrasting core color. • Plastic signs are 60 mil thick. It is loaded with UV inhibitors and should lasts up to 5 years in direct sunlight. 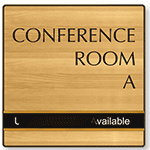 • All Indoor Engraved Plastic signs come with complimentary adhesive strips for fast installation. Choose from a wide variety sign fastening systems, including corner holes and Hoop and Loop Fastner strips at an additional cost. • Sign will tolerate temperatures up to 170°F. • Sign is rigid and does not bend around a curved surface.